Amid lush jungles and hilly terrains, Kanchanaburi weaves itself in its green habitat. Scenic waterways, converging into a large river, underscore the town’s natural charm. In the thick of Kanchanaburi’s landscape, remnants of a cruel past have turned into valuable relics. More than mere attractions, these bear witness to a humble town rising above torment. Check your presumptions at the door; Kanchanaburi is not your typical Thailand destination. It is a loyal refuge for those yearning a low-key, friendly vibe. Built across Kwai Yai river, the Srinakharin Dam serves more than its intended purpose. The dam doubles as a National Park, where you can find deep caves with stalagmite formations. Tham Neramit, Tham Nammood, and Tham Praprang are three caves you can visit. On the banks of Kwae Noi river (River Kwai), Prasat Mueang Singh sings a silent reminder of Khmer Kingdom and its reign. In the excavation around the historical park, precious artifacts, antiques, and ornaments have been extracted. Wat Wang Wirekaram Kao or ‘Underwater City’ lures fascination from local and foreign tourists. In the rainy season, the water flowing from Wachiralongkorn Dam swallows the city. It re-emerges in the dry season for tourists to explore. The best time to visit is from March to April when the water level is at its lowest. The Bridge Over the River Kwai traces Thailand’s bloody past from World War II. The steel bridge is part of the railway lines Japanese soldiers used during the war. Many slave labourers lost their lives in building the tracks. Hence, the bridge is one of Thailand’s historical memorial sites. David Lean directed an award-winning 1957 film based on the French novel ‘Le Pont de la Rivière Kwai’ (The Bridge on the River Kwai). The British Film Institute listed Lean’s work about the storied location as the 11th greatest film of the 20th century. Not far for the bridge is Don Rak or Kanchanaburi War Cemetery. A tourist train now runs back and forth the Bridge Over the River Kwai. 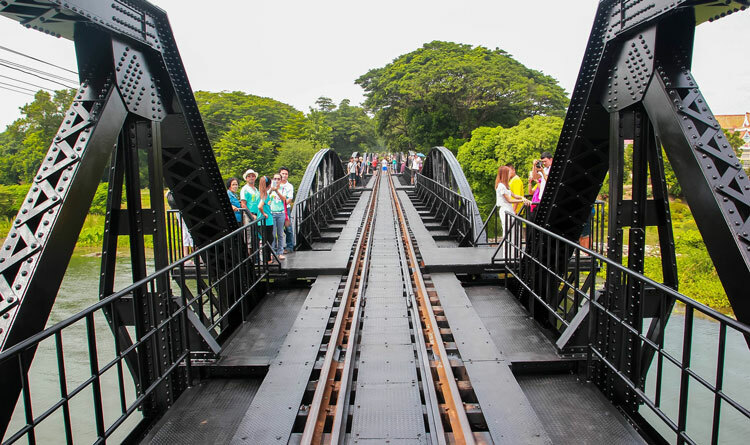 Visitors can walk on platforms on the sides of the railway and get a glimpse of the spectacular view of the river. West of Bangkok, Kanchanaburi is 3 to 4 hours away from Thailand’s capital. First class (air-conditioned and toilet) and second-class buses depart to Kanchanaburi from Bangkok Southern bus terminal and Northern Mo Chit bus.